Bose SoundTouch 20 review | What Hi-Fi? SoundTouch is a new line of products from Bose, built with wi-fi as a point of focus. The wireless speaker systems come in three sizes, and the SoundTouch 20 is the middle model. “Who wants big and clunky?” asks the Bose website. Indeed, the SoundTouch 20 is relatively compact. It has a flat, standing shape, which reduces the size of the unit’s footprint. It will comfortably fit on an average desk or kitchen counter. The design is lovely. As we’ve come to expect from Bose, the unit looks elegant and build quality is high. The black-cloth speaker face contrasts nicely with the glossy white sides, which is subtly patterned. The back is made of black-matte plastic, unadorned with much besides a handful of connections: power, ethernet, 3.5mm input, and a mix of micro and regular USB for set-up purposes. There’s also a bass port, which doubles as a handle. At the top of the unit are the controls: standard on/off aux and volume keys, but also some buttons labelled one to six. These are ‘presets’ that you can programme with specific albums, iTunes playlists or internet radio stations; it’s a crucial part of Bose’s SoundTouch philosophy: to access your favourite music with one touch. It’s a neat idea. We like the simplicity of pressing a single button and knowing exactly what’s about to load. It’s perfect for those times when you’ve got that one album you keep playing, or for the couple of radio stations you always listen to over breakfast. The simple approach does mean there are limits, of course. Once we are used to the idea of presets, we want more of them, especially if there are a few of you sharing the system. Then there’s the matter of content. It’s fine if you know what you want for those six buttons, but there’s no facility on the unit itself to search for anything else. For that, you will have to use the SoundTouch app on your computer or portable device. Set up is easy enough, but we find it a bit long-winded. We have to download the SoundLink software on a computer and sign up to a SoundLink account. In theory, you can plug in an iOS device or computer and just transfer your current settings over, but this didn’t work for us. 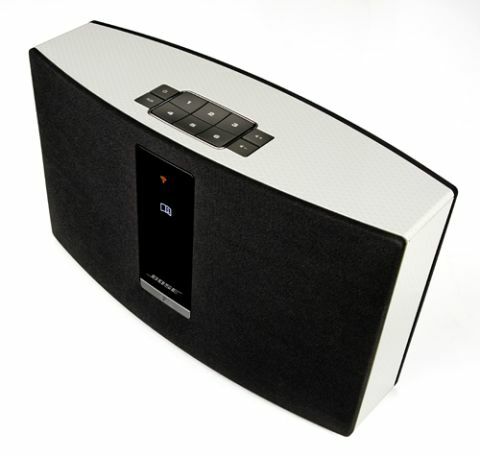 Once connected, the SoundTouch software is basic across all platforms, but easy to navigate. The default-screen is the same six numbers that you find on the main unit. It looks fine on a phone (the control app is free on iOS and Android), but it’s a poor use of space on larger screens. A tiny tab on the right leads you to the options, where you can browse for music. You can also add extra SoundTouch devices for a multi-room system. The alternative is to use AirPlay, which is in your computer’s iTunes or on iOS devices. There’s no Bluetooth, so Android users should be wary. Content comes from whatever device you’re using for control, or from networked computers. Web-based streaming is limited to Pandora and internet radio stations. A greater concern for us is file compatibility. You can play music in MP3, WMA and AAC, but that’s it: those looking for WAV and FLAC will be disappointed. The audio performance is good, but not amazing. Sound is clear and volume is never an issue, going louder than you’d ever need it to without hardening. The scale is impressive and belies the size of the unit and there’s also a good sense of power. Our major issue is the bass. The SoundTouch 20 is capable of diving right down to the depths, but the sound isn’t balanced. The low-end is overstated, and a little distracting. This has an effect on the rest of the performance: there’s little real feeling of agility or dynamic expression, and the result is a performance that feels both unnatural and a little bored. The Bose SoundTouch 20 is a mixed bag. We like the idea of preset buttons, and being able to play our networked library with relative ease. And if you’ve bought into the whole Apple ecosystem, you may like the system’s network integration. We have reservations about the sound, however, and the limitations with compatibility are hard to swallow. Proceed with caution.